Maxtech America mortise lock is equivalent to the door preparation of a Marks 22AC mortise lockset with its special 1" X 7-1/8" edge faceplate and the 2-1-2" backset. This mortise Entry lockset gets installed on exterior Iron gate doors, and includes true-bolted knobs with 2 cylinders keyed alike that can be position with a toggle on the edge to keep in a always open Positions, or to be locked only from the outside, or to be locked from both sides with the 1" steel bolt by the cylinder either side. This Heavy duty mortise security lock enhance the security of the gate And offers added security and peace of mind. Right Hand- Facing door from outside,Push Door to open.Hinges on the right hand side.Knob and Cylinder on the left hand side. Left Hand-Facing door from outside, Push Door to open.Hinges on the left hand side. Knob and Cylinder on the right hand side. Right Hand Reverse- Facing door from outside,Pull Door to open. Hinges on the right hand side. Knob and Cylinder on the left hand side. Left hand Reverse-Facing door from outside, Pull Door to open. Hinges on the left hand side. Knob and Cylinder on the right hand side. Right Hand- Facing door from outside,Push Door to open.Hinges on the Left hand side.Knob and Cylinder on the Right Hand side. Left Hand-Facing door from outside, Push Door to open.Hinges on the Right hand side. Knob and Cylinder on the Left Hand side. Right Hand Reverse- Facing door from outside,Pull Door to open. Hinges on the Left hand side. Knob and Cylinder on the Right Hand side. Left hand Reverse-Facing door from outside, Pull Door to open. Hinges on the Right Hand side. Knob and Cylinder on the Left. 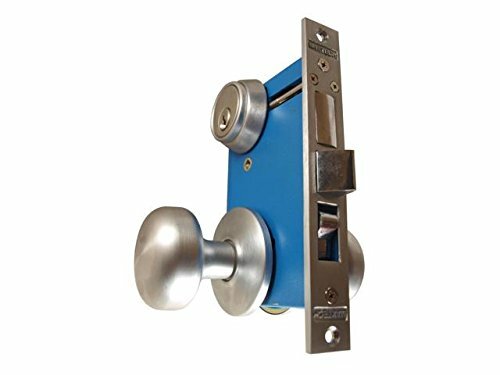 2-1/2" Backset, Lock Face front: 1" W X 7-1/8"H.
Double solid brass cylinders Schalge Keyway keyed alike with 2 keys. Spring loaded spindles with Strike and mounting screws included. Works and fits same as Marks 22AC. If you have any questions about this product by Maxtech America, contact us by completing and submitting the form below. If you are looking for a specif part number, please include it with your message.